We are all born at a distinct moment and place in time. The position of the planets at that moment indicates our life path in terms of how we assert, relate and communicate. Yet we are not static creatures. We are always changing. One of the changes we go through – in an astrological sense – is a kind of inner shift in how we experience life and express ourselves. 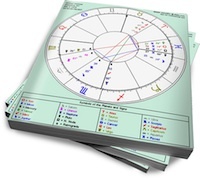 In contrast to transits – in which the planets “out there” make significant angles to the planets in our natal charts – there is another form of predictive astrology called progressions. There are many forms of progressions, but the most popular kind is called secondary progressions. In calculating secondary progressions, one views a day of your life as equivalent to a year in your life. Metaphorically, this makes sense. You wake up (Spring). After a while you start getting really active in your day (Summer). You wind down in the afternoon (Fall). And at night you go to sleep (Winter). Technically, secondary progressions work like this: Let’s say you’re 20 years old. You look at where the planets were on the 20th day of your life. So if you were born on April 15, you would look at where the planets were 20 days later in the year of your birth (or the year after if you were born in late December). It’s rather easy to get your progressed chart for free at sites like astro.com, but to see them in action it helps to look at an ephemeris, which is a set of tables illustrating where the planets are on every day of every year. Let’s look at the ephemeris for 1990 (PDF). For someone born on April 15, we see that Venus is at 9 Pisces. (Look at the fifth column.) Count twenty days (you’ll have to move into May), and you’ll see that the numbers get higher and then go back to 0. That means that on the 20th day of this person’s life, Venus is now in Aries. Venus has changed signs. If you didn’t know astrology, you might think you’re going crazy. This is quite a drastic shift from how you’ve expressed your Venus all your life. With an understanding of secondary progressions, you can see this change as a natural development of yourself as a soul over time. Secondary progressions are not always this simple, though. Venus also moves retrograde (apparently backward), so it could move into the previous sign during your lifetime, and then move direct back into the the sign of your natal Venus placement. Or it could not change signs for your entire life. For example, Venus will enter Scorpio on September 8, 2010 and not move into Sagittarius until January 7, 2011. In secondary progressed terms, that’s over 100 years, so a child born, say, in late September will not see a change in the sign of her progressed Venus in her lifetime. Great article and makes obvious sense. It always amazes me; the more I learn about astrology the more scientific and real it becomes. I found an article through a Google search on the different meanings of progressed Venus. My natal Venus in Leo has progressed into Virgo and the interpretation offered by the author fits the bill. Im very interested in somethign. I have venus in scorpio and my woman has venus in virgo is that compatiable at all? @vixen19 care to share the link in the comments section? Very helpful. I’ve been journaling my experiences and my feelings for the past 3 months so I hope to go back and test the theories soon. yes! please! share the link! Jeffrey, thanks for this interesting article. I would like to hear more about progressions such as maybe the moon’s progression and how they play on our relationships and feelings, maybe even mars progressions as well. Also any more depth to how the progression itself works would be helpful. I understand the basic description that you take on new personality traits but do you drop the old ones or do they layer on each other or merge together? I have natal cap venus with a progression into aqua (Also my sun and mars) when i was 16. it won’t move onto the next progression into pisces until my early 40s, so about another decade. i think that will suit me at that point in my life as i expect to be a bit mellower by then. Lol. Ahhh, I think i got my answer in Lara’s article. All those returns! Egat, i remember my saturn return and it was literally the most difficult year of my whole life and all having to do with grown up themes: doing what you have to do to survive even if you hate it just to keep the basic necessities of food, shelter, and safety in life. I hear the second time it returns its not as bad. @Phenix/scorpio venus in scorpio and venus in virgo are compatible, they’re both “yin” or negative polarity (water/earth). Wow! progressed Venus in Capricorn here. I have become less idealistic (natal Venus is Sag) and more grounded in my approach and view of relationships. Believe me, I have been through some hard knocks when it comes to love and have become much wiser and more selective in this arena. Caution is key nowadays. Also, my natal sun (Libra) has progressed into Scorpio. I’ve been feeling very plutonic as of late. It conjuncts my natal Mercury in Scorp. I’m not as gullible as I used to be. In my opinion it’s not meant for the astrology rookie but it’s very interesting to see how much sense he made out of the numerous celebrity relationships he used as an example. You’ve GOT to check it ou! This concept is very intriguing. As a natal Sag sun/Venus in my early 30’s I’ve noticed that I’ve been looking for more stability in romantic relationships, which has had me kind of at odds with myself because as a Sag romantic stability has never been my cup of tea…now that I see my Venus (and sun) has progressed into Capricorn territory these “grownup” feelings that I’ve been having are beginning to make sense now. However, the question for me now is when it comes to romance are fire/air signs more compatible for me or should I be looking for mates with heavy earth/water placements? I have noticed that in the past two years I seem to attract men with deep water sign placements…especially Scorpio (Pisces too). Wild. candicoated624 I think you may be posting under the wrong post. This is about secondary progressions not compatibility. Anyways both your Suns and Venuses are opposite each other (respectively) so there’s a feeling of complementing each other yet getting on each other’s nerves. my progressed venus is in 29.28 degrees of pisces. What does that mean? I have Venus in cancer squared by Pluto and triNed by Uranus I remember the crazy times when progressed Venus made a sextile to Jupiter but I can testify how much I have calmed down when Venus entered into Leo I was more interested in committed relationships.. I have an other very fortunate transit now because Venus is in contact with regulus royal star and very soon about to enter virgo..I don’t really need anyone to criticize me more so I decided to be single for a couple of years but I would think Venus and Virgo is very comfy because they are both of them are earth signes. I would like to recommend Robert hand’s paperback book planets in transit to anyone wish to learn astrology just keep in mind it is not easy topic and it’s definitely not easy to learn astrology is still considered to be a taboo amongst many many but if you buy Roberts book and continue to do your own research it is very calming it’s affordable and doesn’t talk back ? that was a joke. I am new to astrology and secondary progressions. I was born with Venus retrograde in Scorpio, this will progress to Venus direct in Scorpio in about a year and I have already undergone big changes in relationships. The question is what effect will Venus going direct have, positive I hope! ?